Classical - Antebellum Parlor Music - From sprightly polkas to lilting waltzes, haunting melodies of love and longing to selections from the stage and operas of the period, Nashville's finest musicians recreate the lively Antebellum spirit. 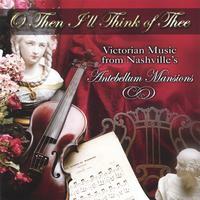 This charming collection of music was performed in the grand parlors of Nashville's antebellum mansions and represents a remarkable time capsule of this bygone era's entertainment. From sprightly polkas to lilting waltzes, haunting melodies of love and longing to selections from the stage and operas of this time, Nashville's finest musicians recreate the lively spirit and graceful beauty of this important chapter of Nashville's rich musical heritage. Information included in our liner notes contains brief histories and pictures of three beautiful Nashville antebellum mansions that have survived to this day, and are now beautifully restored museums; Belle Meade Plantation, Belmont Mansion, and Travellers Rest. All the music heard on "O Then I'll Think of Thee" was found in the archives of these three mansions, and taken directly from the songbooks compiled by the mistresses of each estate. Also included are brief biographies of these fascinating women who lived therein, owning and performing this music in their own parlors. Music had become a well-established part of life in Nashville from its beginning - actors and musicians were a regular stop on the performing circuit and Nashvillians pursued dramatic and musical activities. Music was once considered an indispensable accomplishment in the education of young ladies. Piano music was especially popular; in 1854 a newspaper noted "...there were probably more pianos in Nashville than in any place of its population in the U.S."
Antebellum Nashville emerged as a prosperous city of unique character and sophistication. The beautiful countryside was filled with prosperous plantations and estates, the setting for many elegant mansions with impressive architecture. The monumental Tennessee capitol building finished in 1859 crowned the city's highest hill. Steamboats on the Cumberland River and railways made the city a crossroads of transportation, with the economy having a diverse base. The city was known for its educational and religious institutions and for its politicians, sending Andrew Jackson and James Polk to the presidency. "O Then I'll think of Thee" was co-produced by David Angell and Russell Davis. David Angell is one of the most active and versatile violinists in Nashville's recording industry, performing with a wide array of artists. Raised in a Quaker household in suburban Detroit, David began his violin studies at age 5. He holds degrees in Violin Performance from Indiana University and Yale School of Music, where David studied with the world renowned Tokyo String Quartet. He also served as Instructor of Violin at Yale University, and performed in the Yale Faculty Chamber Series at Merkin Hall in New York City. His daily activities include performances as soloist, as a member of the Sacred Arts String Quartet, and as contractor of string sections for recordings, televisions shows and live events. His work has appeared on recordings of artists including Denyce Graves, Bruce Springsteen, Bob Seeger, Andy Griffith, Dolly Parton, Garth Brooks, Neil Young, Jimmy Buffett, Charlie Daniels, Andy Williams and Jaci Valasquez. He resides in Brentwood, Tennessee with his wife Monisa, and their two children. Russell Davis, pianist, is a mainstay of Nashville's music industry as producer, arranger, composer and performer. "O Then I'll Think of Thee" is his fifteenth venture as a record producer for a variety of Nashville labels and independent artists. with other projects to his credit varying in style from jazz, pop, Christian, to new age and easy listening. In addition to his duties as educator and performer at both Belmont University and Harpeth Hall School in Nashville, Mr. Davis is a frequent performer in Nashville's many performance venues. Comfortable in many genres, including classical, jazz and music theatre, Russell lends his signature emotive phrasing to his every endeavor. "O Then I'll Think of Thee" represents a culmination of his interests in Nashville history, music and Southern architecture. He states, "As a native Nashvillian and musician, I am delighted and proud to preserve in a living manner a piece of Nashville's music and cultural heritage- I think the musicians on this project capture the dynamic spirit and charm of this unique stylistic period in American music." Excellent.! One of my friends heard it and ordered eight copies! pleasant, sensitively performed bit of music. Beautiful, captures a bygone era. Beautiful, lilting music. Captures a bygone era of Nashville. Romantic, yet historical. Shows the versatility of these performers.